AMAZING TEA! KEEP READING!!! Rooibos Tea - pronounced ROY-boss. 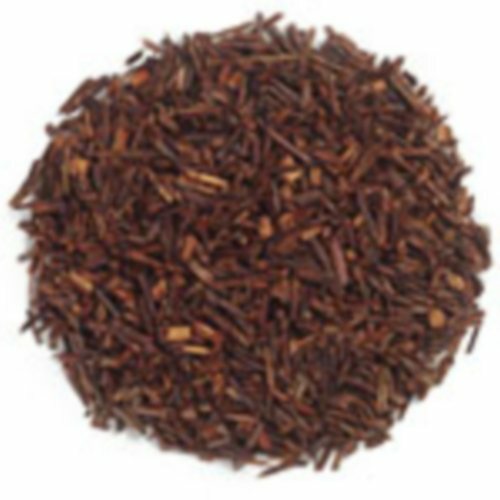 Native to the mountains of South Africa, Rooibos Tea is prized for its great flavor and contains important minerals and vitamins. It boosts anti-viral, anti-spasmodic, anti-allergic properties as well as anti-oxidants nearly 50 times more active than green tea! In addition, it has iron, magnesium, potassium, fluoride, calcium, vitamin C, zinc, manganese, and fair amounts of alpha-hydroxy acid known to promote healthy skin. Naturally caffeine-free, it helps relieve insomnia, nervous tension, indigestion, and allergic symptoms. Recent research also indicates that it contains the highest known levels of anti-aging properties of any plant on earth. Truly a tea that should be part of everyone's daily diet. Our Rooibos Tea is 100% certified organic and of the highest quality. Antioxidants 50 times more active than green tea? They should teach us this stuff in high school !!! Order your Red Rooibos today and start enjoying the incredible health benefits of this tea for you and your family.